Jon Turner opens the button to 24,000, and Marc Friedman three-bets to 36,000 from the small blind. Turner calls. Friedman draws one card and bets; Turner two and a call. On the second round, Friedman is pat and bets 24,000. Turner improves to a one-draw and likes it enough to call. They both pat the river, and Friedman bets all in for what looks like exactly one full bet of 24,000. Turner shrugs and calls. Friedman shows down for the eighty-six, but Turner has drawn better. He tables , and the smooth eight earns him the knockout. Friedman wishes his table luck, though his son Adam has a few choice words for Turner. "F**** you!" the younger Friedman jokes as he and Turner shake hands. "Just kidding, good luck." Benny Glaser has been doing some serious work in the last few orbits. Thanks to some recent stumbles from Sergey Rybachenko, Glaser is now the commanding chip leader with nearly twice as many chips as his nearest foe. In the most recent pot, he extends that lead even further. Glaser opens the cutoff to 24,000, and Jon Turner three-bets to 36,000 on the button. Glaser four-bets to 48,000, and Turner calls. They each draw one card, and Turner calls the 12,000. Glaser is pat now and still betting, while Turner draws one more card and calls for 24,000. They both pat the last round, and Glaser fires right back out for the last 24,000. Turner doesn't seem to love it, but he makes the call to see what's what. "Seven," Glaser announces, and Turner slaps his hand down in frustration. , and Number Three wins him the pot. Steve Billirakis and Sergey Rybachenko both draw two cards. Billirakis puts out a bet and Rybachenko calls. Billirakis pats and Rybachenko gets two more. Billirakis bets and Rybachenko raises him. Billirakis shoots him a look before calling. They both pat the last draw and Billirakis checks along with Rybachenko. Billirakis fans and scoops the pot. First in from the button, Steve Billirakis comes in raising to 24,000. Sergey Rybachenko (small blind) and Toby Mulloy (big blind) call to draw some cards. Rybachenko draws two cards; Mulloy and Billirakis two apiece. Rybachenko likes his hand, though, and he leads out for 12,000. Mulloy raises to 24,000, and Billirakis makes it three bets for 36,000 total. 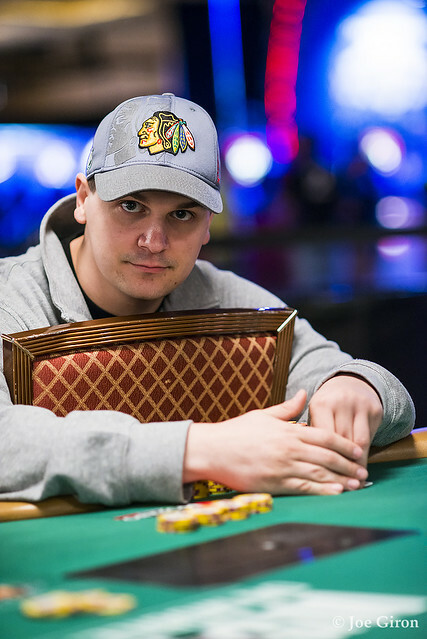 Rybachenko calls, Mulloy four-bets to 48,000, and Billirakis caps it with an all-in five-bet to 54,000 total. Both opponents call, and Billirakis is at risk. Rybachenko is the only one still drawing a card, and he check-calls a bet of 24,000 from Mulloy. The last round sees Rybachenko draw one more card and check again, and Mulloy checks behind him. Mulloy tables , and Billirakis realizes he can beat it. He enthusiastically fans out , tripling up with his eighty-six. Mulloy collects the sidepot as Rybachenko mucks. Steve Billirakis opens to 24,000, and Sergey Rybachenko three-bets to 36,000 in postion. Billirakis calls. Both players draw one card, and Billirakis check-calls a bet of 12,000. Rybachenko is pat now, and he bets again. Billirakis draws the same single card and check-calls 24,000. On the last round, Billirakis still needs one card, and Rybachenko pats and bets again. Billirakis spends a long while in the tank before folding. Steve Billirakis opens the cutoff to 24,000, and the rest of the table quickly folds. Billirakis fans out his pat and says, "I had that made." Jon Turner raises from the cutoff and Phillip Hui calls in the big blind. Both players take two cards and Hui checks. Turner puts in a bet and Hui raises the action with Turner calling. Hui moves all in after drawing one and Turner calls after taking one as well. Turner pats his third draw and shows . Hui is drawing live with a . He pulls a though, and is eliminated. 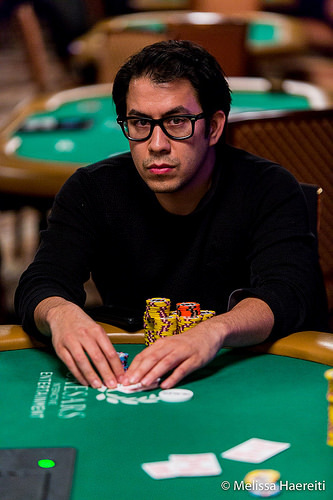 Brock Parker opens the cutoff to 24,000, and action comes to Phillip Hui in the small blind. "Bump it," he says, putting 24,000 chips into the pot. In the ensuing discussion, it appears that he intended to raise but failed to recognize Parker's opening raise in front of him. We know from Hui's previous experience that "Pump it," does not equal a raise. It sounds like Hui heeded the advice, but the "bump" drew some sideways looks too. The floor is called, and the verbal declaration is ruled a non-standard betting action. "'Bump it' means nothing," the floorman rules. It's a call. Benny Glaser calls from the big blind too. 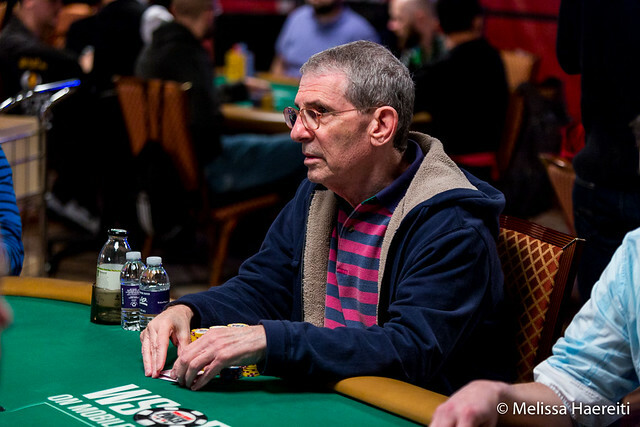 Everyone takes two cards, and Glaser leads the betting for 12,000. Parker says, "Bump it," as he folds. Hui check-calls, though, and it's heads-up the rest of the way. Glaser is pat and bets, while Hui draws two more cards and calls the 24,000. On the last round, Hui improves to a one-draw and check-calls one last bet from his pat opponent. Glaser tables to win the pot with an eighty-seven. Players are now on their first 20-minute break of the day. The first draw comes between Sergey Rybachenko in the cutoff and Andrew Brown on the button. They both draw two cards and Rybachenko bets into Brown who calls. They draw one for the second draw and Rybachenko bets with Brown calling. Rybachenko draws one and Brown pats on the third draw. Rybachenko bets once more and Brown calls. Rybachenko fans to win the pot. He now stands far above the field with 650,000. Brown holds onto 210,000. Moments after tripling up, Dutch Boyd drops a significant pot to leave himself once again on the short stack. This time, he's unable to recover. On what will be his final hand, Boyd defends his big blind behind a Jon Turner button-raise and a call from Brock Parker in the small blind. Turner is in front with his one-draw, and he bets 10,000. Parker draws two and folds, while Boyd draws two and check-raises to 20,000. Turner makes it three bets, and Boyd calls all in for 30,000 total. The at-risk Boyd is pat for the last two rounds. Turner draws one card before patting the last round himself. Content with their cards, the two men table their hands. Boyd shows , but it's second best. Turner's wins the pot and sends Boyd to the cashier in 11th place. Dutch Boyd raises to 20,000 under the gun, and Benny Glaser three-bets to 30,000 on the button. Jon Turner cold-calls from the small blind, and Boyd calls the extra bet too. Glaser draws one card and bets. The other two draw two cards apiece, and they both check-call. Boyd has just 25,000 chips left in front of him now. Everyone draws the same amount on the next round, but it's Boyd who leads out into the pot for 20,000. 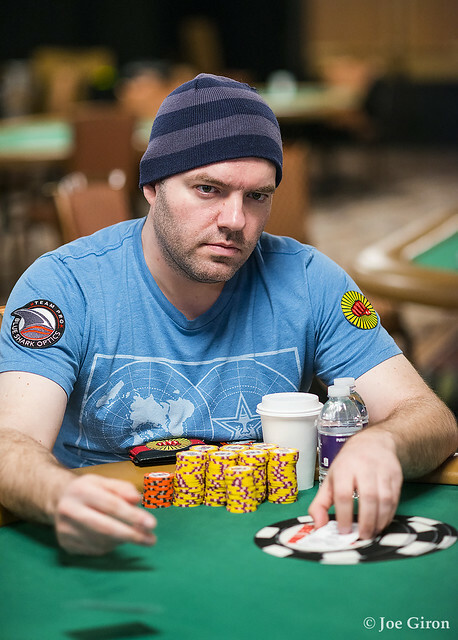 Glaser raises, Turner folds, and Boyd calls all in for his tournament life. He pats and shows his made . Glaser draws one, showing up as he awaits the last card. It's a , giving Glaser an inferior nine-low. Boyd pumps his fist at the sight of his winner, dragging the pot to nearly triple up. Under the gun, Kyle Miaso moves all in for 11,000. 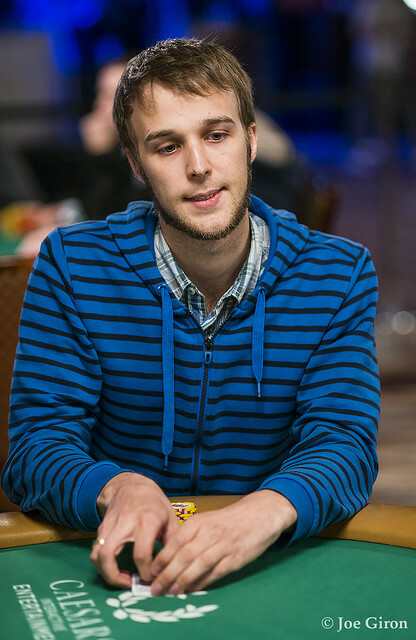 Dutch Boyd makes the full raise to 20,000 next to act, and Brock Parker defends his big blind. Parker draws two cards and folds on the next round, so Miaso ends up heads-up for his tournament life. Boyd is pat for the last two rounds, while Miaso draws one on each street. When the last draw is complete, Boyd tables the hand to beat with . Miaso his content to see that his four-card is drawing live for the double-up, and he verbally squeezes a no-spotter. It's an , though, and that seals his elimination in 12th place. Kyle Miaso raises to 20,000, and Dutch Boyd three-bets in position. Miaso calls. Both players draw one card apiece, and Miaso checks. Boyd pump-fakes a bet, and Miaso pump-fakes a call, but the action ends up going check-check. They both draw the same single card again, and now Boyd does bet the 20,000. Miaso check-calls and draws one more card, while Boyd is pat. When Boyd bets, Miaso quickly folds, and he's nearly down to the felt now with less than a big bet. Dutch Boyd opens with a raise to 20,000, and Sergey Rybachenko calls on the button. Andrey Zhigalov three-bets to 30,000 in the small blind, and Boyd and Rybachenko call the extra bet. Everyone draws two cards, and Zhigalov flicks his last 2,000 chips into the pot. Both opponents call, and everyone improves to a one-draw for the next round. Boyd check-calls a bet from Rybachenko, and he draws one more card. Rybachenko is pat for the last round, and the two live players are content to check it down. Boyd flashes a , prompting Rybachenko to table his . Zhigalov examines it carefully as he rolls over his inferior . 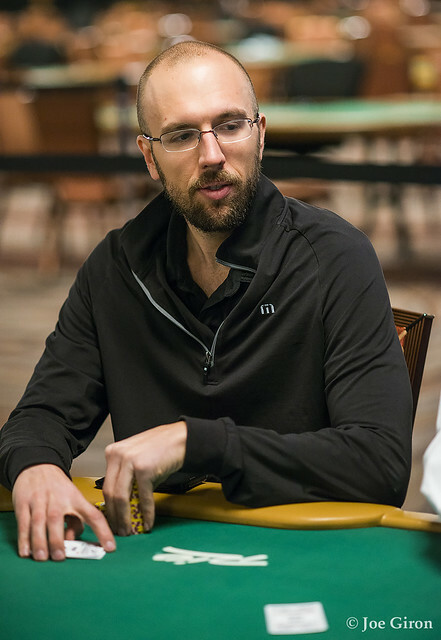 Zhigalov is eliminated by his countryman in 13th place, and the remaining field is being redrawn around the final two tables. Phillip Hui raises to 16,000 from the small blind and gets a call from Brock Parker in the big blind. Both players take two cards and Hui bets 8,000. Parker raises to 16,000 and Hui calls. For the second draw, they both take one. Hui bets 16,000 and Parker raises to 32,000. Hui calls and they stand pat for the third draw. Hui checks and Parker bets. Hui reluctantly calls and is shown by Parker. Phillip Hui raises to 16,000 from the cutoff, and both Brock Parker (button) and Kyle Miaso (small blind) call. Parker ends up folding after the first draw, so he doesn't factor into the hand. Miaso draws two cards and check-calls a bet from Hui, who'd drawn one. They both draw one on the next round, and now Miaso leads out for 16,000. Hui calls and draws one more card. Miaso is pat, and he checks. Hui likes what he sees enough to bet it, and Miaso pays off the last 16,000. Hui shows , and his rough eight is the best hand. His stack has once again been volatile to begin the day, but he's trending upward right now, while Miaso needs some help.